At normal temperatures carbon dioxide is a colourless gas that exists naturally in the Earth’s atmosphere. The air that we breathe has about 0.03% of carbon dioxide in it. 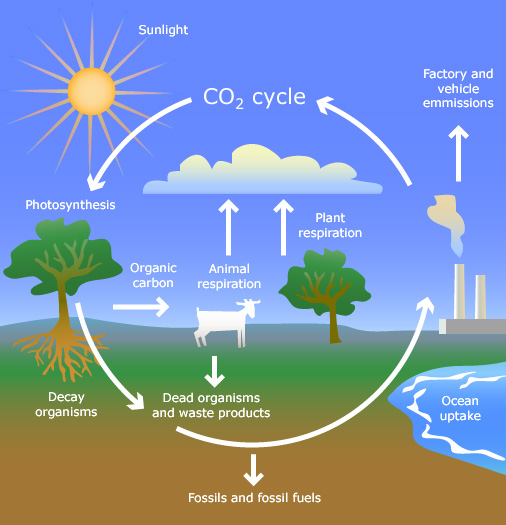 Carbon dioxide is an important part of the carbon cycle and essential for life on Earth. Without it temperatures on our planet would be very low. Plants use the sunlight and take up the CO2 in the atmosphere to produce energy and oxygen. This process is called photosynthesis. The gas is also produced when fossil fuels are burned. Carbon dioxide that has been stored for millions of years in coal, oil and natural gas is set free. Living creatures produce carbon dioxide when they breathe out. It is emitted from volcanoes and hot springs. Deforestation sets carbon that is stored in trees free. Carbon dioxide is an important greenhouse gas. Light that enters the atmosphere it is converted to heat. Higher amounts of CO2 make the atmosphere denser and keep it from getting out. CO2 is a gas that is highly responsible for global warming. Since the Industrial Revolution of the 1800s the amount of CO2 in our atmosphere has risen by 40%. Throughout the centuries carbon dioxide has been in balance. Now more carbon dioxide is being produced than can be absorbed by nature.